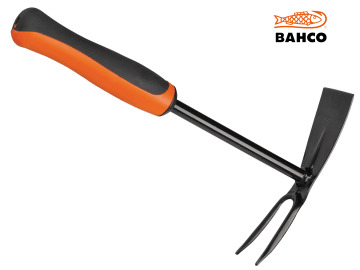 This Bahco small garden hoe has 2 different heads, making it a versatile tool for different jobs. The two-prong fork is ideal for loosening the soil to aerate, whilst the hoe blade is suitable for loosening the ground and for breaking clogged soil or cutting weeds. With a head made of fully hardened steel, it is highly durable and its epoxy powder coating ensures protection against rust.